LA is a city of some seven million people. That's a lot of folks with a lot of different hopes, dreams, and aspirations. Me, I'm just another one of the seven million. But my line of work is a bit different from most of the other suckers. I'm Sam Kane, Finder of Lost Holidays! How did I get into this racket? 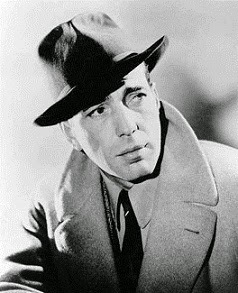 I used to be Sam Kane, Finder of Lost Cellphones. That was good money at $500 a day plus expenses until people caught on all they had to do was dial their own cellphone number and they'd find their phone under the bed or in their other pants pocket. So I'm working the holiday heist beat these days. I'd like to say it's a living, but with three ex-wives and enough alimony to sink Bill Gates, that it could never be! Well, I was sitting in my office on a Thursday afternoon that was so slow Governor Christie could have beaten it in a foot race. I was boning up on the latest news in lost or missing holidays --- North Dakota's Rock Salt Festival had just gone missing and in Indonesia someone had ripped off Kimono Dragon Entrails Day --- when she came in. The dame stood four foot three with a shape like a bassoon. She had short tufts of red hair, a pushed in nose, and toenails you could use for mountain climbing. If you're looking for a story with a little romantic interlude later on, you better look elsewhere. "So what's your beef, sister?" "Mr. Kane, I'm Angelica Who from Whoville." 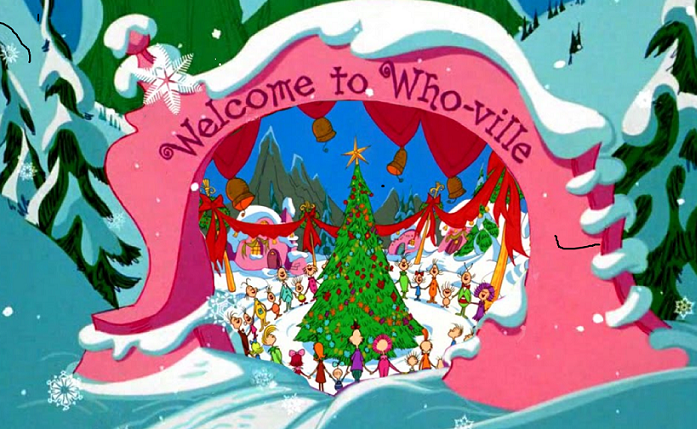 I was familiar with Whoville. I'd spent two weeks there one night. "Mr. Kane," she went on, "someone has stolen Christmas!" "Everythings gone. Decorations, presents, Santa, reindeer, elves ..."
"Yes, Baby Jesus too! And every last bit of gold, frankincense, and myrrh." And myrrh! The words cut through me like a knife sold on a late night infomercial which dramatically cuts your time making julienne fries. Only one man was devious enough to steal myrrh. The same one man who actually knew what myrrh was! "Sister, I already know who the culprit is," I told Ms. Who. "It's Maximilian De Grinchford Jr., an international holiday thief of great renown, also known as the Grinch." "How do you know it's him?" asked the Whoville doll. "The Grinch is the only one who has the capability to pull off this job. Why, he's the one who stole St. Clorox Day!" "See that? Stole it so cleanly you don't even remember it existed. It was the late March holiday for liquid bleach." I knew that the Grinch had been seen in Eastern Europe trying to fence parts of Labor Day he'd stolen last September, specifically a load of barbecue equipment and one beer cooler. I bid Ms. Who goodbye after grabbing a retainer of $250 and credit for one shitload of candy canes once I got Christmas back, and headed for Prague in the Czech Republic. Upon arrival I made a number of connections among the seamiest and most dangerous of local underworld types including guys with highly visible neck tattoos that read "I Savor Parsing the New Yorker" until I found a gentleman named Willie the Snitch who directed me to Cafe Praguelegs, where at long last at a corner table behind a vail of smoke seated next to a leggy blond was the green-hued gentleman I knew as the Grinch. "Hello, Grinch, it's been a while." "Kane! Why, I haven't seen you since you tried to pin that St. Clorox Day job on me. Getting whiter whites these days, are you?" I wasn't gonna rise to the bait. 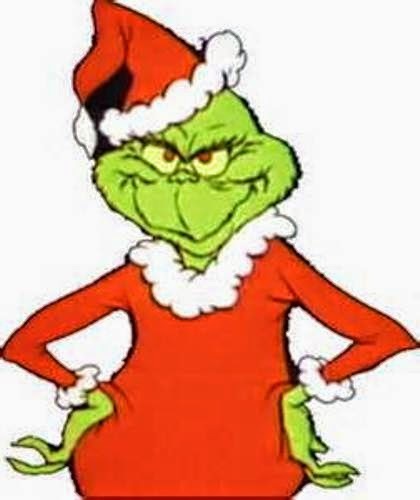 "Grinch, I'm not going to screw around. You've got Christmas, I want it back." "I don't know anything about any Christmas, Kane," said the Grinch. "Then why is Will Ferrell as Elf sticking out of your left pocket?" "Um ... no, Kane, that's not Will Ferrell as Elf. That's Will Ferrell as Anchorman. Totally different thing." Sounded reasonable. But then I remembered the Grinch thought Anchorman was overrated, just like I did. I leaped at the Grinch with a karate chop to the neck, but unfortunately I missed and killed Will Ferrell. Kind of a shame but at least we're spared another Anchorman sequel. I caught up with the Grinch in Istanbul, where we exchanged gunfire. I had to exchange mine because it was in the wrong color and size; I don't why he took his back. Then I tracked him to Venezuela where we fought hand to hand, then Madrid where we fought hand to ankle and nose to elbow, and finally to Stockholm where we fought hair weave to hair weave and hand wave to hand wave at a distance of 25 feet. I knocked the Grinch to the ground with a hand wave nothing short of the way Granny waves at the end of The Beverly Hillbillies and was upon him. "WHERE'S CHRISTMAS?!" I cried "WHERE'S CHRISTMAS?!!" "Kane! Kane! I give up," gasped the Grinch. "You're not going to believe me, Kane," sputtered the Grinch, "but I gave it away!" "You gave it away? You gave it away? Well, excuse me, Mother Teresa!" "I swear it, Kane! I gave it away." "I gave it to the people of Liberia, Sierra Leone, and everywhere in Western Africa struggling with Ebola. They need it." "I'll have to confirm that, Grinch. But what possessed you?" "For some reason this year, Kane, my heart grew three sizes." "That's impressive, Grinch. I'd like to duplicate that growth on myself, but on a different body part." Well, it turned out the Grinch was telling the truth. He'd given the nations of Western Africa a one year loaner of Christmas, to be returned to the folks of Whoville by next year. When I told them, the residents of Whoville were delighted to help out those less fortunate in this way. Plus I'd still get all my promised candy canes next year and I had a pretty hot romantic interlude with Angelica Who after all. "Well, Grinch, it looks like this could be the start of a beautiful friendship! Grinch? Grinch?" "Goddamit, Grinch, get your hands off Hanukkah!" So, are those toe nail marks on your back, Kane? I knew you loved short, heavy-set redheads, but tell us the truth--it was the leg hair that turned you on, right? This was my favorite line, "I'd spent two weeks there one night." I've been on a few business trips like that. Not a place you want to stay any longer than you have to. Leg hair it is, pal. Ever since that I shacked up with that doll from Bulgaria in Kansas City a few year back, it's been leg hair love with me all the way. You seem like the kind of guy who thinks like me --- love 'em hard, love 'em fast, leave 'em quick. Unfortunately there's very rarely another person involved.